When Bethany Dillon came on the scene in 2004 at the young age of 14, it was not only the depth of her songs that garnered attention but her distinctive alto voice that sang with deep soul and wisdom of someone twice her age. In concert, both Bethany's songs and voice are showcased as production is mostly acoustic and spacious. Though some might say 'unplugged' albums are overdone, for artists like Bethany, it just works and has proven to be fan favorites. 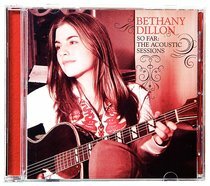 So Far: Acoustic Sessions provides Bethany's fans exactly what they've wanted: an organic, stripped-down album of their favorite songs along with "Hero" from Chronicles of Narnia Soundtrack, and a Beatle's cover to top it off. Recorded over 2 days in a studio, this album has the 'feel' of an intimate live show. About "So Far: Acoustic Sessions"